The Indonesian president was referring to artificial intelligence, big data, robotics, biotechnology and self-driving vehicle technology, saying Indonesia was ready for them and could be expected to embrace them more quickly than it adopted smartphone technology a decade ago. 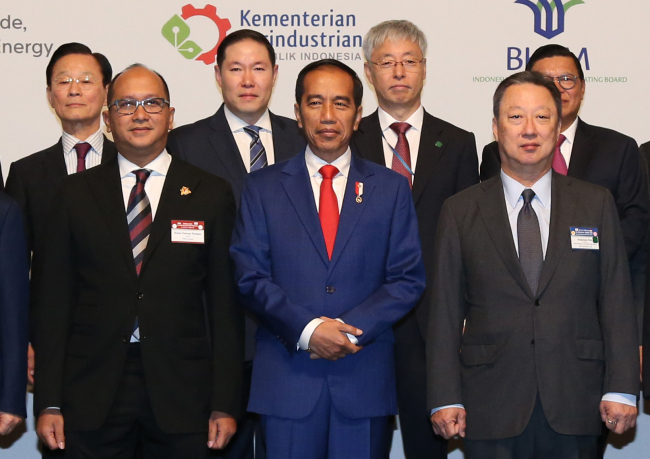 In April, Widodo launched his country’s “Making Indonesia 4.0” campaign, a policy initiative to advance the manufacturing sector through technology. The Indonesian president, here on a three-day state visit, was addressing trade experts and representatives of governments and businesses on both sides at the forum, co-organized by the Korea Chamber of Commerce and Industry, the Korea International Trade Association and Kadin Indonesia, the Indonesian Chamber of Commerce and Industry. President Widodo also stressed Indonesia’s role as an export base for bigger markets such as Australia. Introducing the Indonesia-Australia Comprehensive Economic Partnership Agreement, which he and Australian Prime Minister Scott Morrison signed two weeks ago, Widodo said his country could serve as a springboard for Korean companies hoping to do business with Australia. The president also thanked Korean companies operating in Indonesia. Korean-owned garment and shoe factories employ more than 900,000 workers, and Korean businesses are a major source of investment in the chemical and steel sectors. Korea is the third-largest foreign investor in Indonesia. In response, Kim Hyun-chul, chairman of the Presidential Committee on New Southern Policy, reiterated President Moon Jae-in’s support for stronger business ties with ASEAN countries and suggested that the Indonesian leader consider pursuing joint projects that would advance his country’s economic growth. For example, Kim suggested that Korea’s National Research Council for Economics, Humanities and Social Science and its counterpart in Indonesia undertake a joint study in Indonesia, saying the council could offer a great deal of experience and knowledge, gained as a result of Korea’s economic miracle in the ’70s and ’80s. At the forum, Korean Trade Minister Baek Un-gyu also vowed to expand bilateral partnerships in manufacturing, infrastructure projects and future technologies, saying he would like to see freer trade between the two countries. A total of 15 memorandums of understanding were signed at the event, including one on a hydroelectric power development project in Indonesia involving Posco E&C, Hyundai Engineering and Korea Midland Power. Posco E&C, KEB Hana Bank and IBK Investment and Securities signed a separate memorandum of agreement with MNC Lido concerning the first phase of a development project in Indonesia involving the mass-construction of resorts and entertainment facilities.